Why are ticks a concern? Ticks are a serious concern for North Americans, especially during the spring and summer months. According to the Centers for Disease Control and Prevention (CDC), Lyme disease, one of many diseases carried and transmitted by ticks, affected more than 30,000 Americans in 2013. Because ticks thrive outdoors, it is important to understand the risks associated with tick bites and how they can be prevented. Ticks vary in color and size by species and stage of development. Adults have eight legs and are smaller than a sunflower seed (1/8 to 5/8 inch long if engorged with blood), and their biological and physical characteristics make them difficult to kill. Common tick species that bite and can transmit diseases include the deer or black legged tick, American dog tick and lone star tick. Ticks are found throughout North America, especially in the northeastern United States. They usually live in or near heavily vegetated or wooded areas with shrubbery and grass. These habitats are ideal, as ticks can easily attach themselves to passing animals that vibrate the ground and release carbon dioxide. Various species of ticks and related tick-borne diseases thrive in different regions. Why should I be concerned about ticks? Ticks not only are a nuisance, but they are also highly dangerous pests. In addition to Lyme disease, ticks also can carry and transmit Rocky Mountain spotted fever, Colorado tick fever, babesiosis, relapsing fever and tularemia. In fact, ticks cause more reported illnesses in the United States each year than mosquitoes, making Lyme disease the most common vector-borne disease in the United States, according to the CDC. How can I help prevent a tick infestation? Use a repellent with DEET on exposed skin. Wear protective clothing when spending time outdoors. Spray clothing with products containing permethrin, which offers protection even after several washings (follow product instructions). Always check your body and your pets for ticks promptly after spending time outdoors. Reduce the number of ticks near homes by clearing shrubbery and mowing grasses. Move children’s play areas away from trees and shrubs. Work with pest management professionals to locate and eliminate infestation sources. What do I do if I suspect a tick problem around my home? Because of the health concerns related to ticks, anyone suspecting a problem should contact Enviroguard pest management professional. Enviroguard professionals can identify areas around your home that are inviting to ticks, we also offers tick control services. If you find a tick attached to the skin, it is best to remove it with fine-tipped tweezers only (alcohol, nail polish, hot matches, petroleum jelly or other methods may traumatize ticks, causing them to regurgitate and infect you with the germs they carry). In some regions with high Lyme disease rates, preventive antibiotics may be advised if a tick was attached longer than 24 hours. 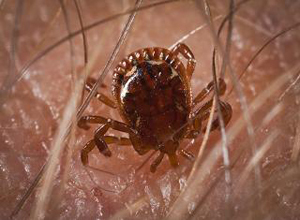 If you or a family member receives a tick bite and develops signs of illness such as fever or rash, immediately see a health care provider.